NASA's original Shuttle Carrier Aircraft, NASA 905, as seen on static display at Ellington Field during the Wings Over Houston Air Show on Oct. 27, 2012. Houston, you have a space shuttle ... carrier aircraft. 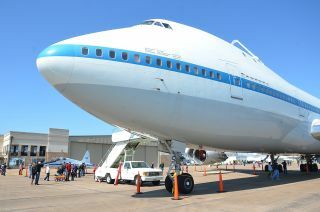 NASA's original jumbo jet, which was used to ferry the space shuttles around the country, has landed at Ellington Field in Houston, where it is to stay. The Shuttle Carrier Aircraft (SCA), often referred to using its tail number, NASA 905, was most recently used to fly space shuttle Endeavour to Los Angeles in September. The 747 jetliner was seen by millions of people as it made its way from the Kennedy Space Center in Florida to California, where it performed a scenic flyover of the state with Endeavour riding piggyback. Then a flight plan was filed for Ellington Field. NASA 905 was flown to Houston on Oct. 24, just in time for it be on hand for the Wings Over Houston Air Show. The rumor on the flight line was that the public display was a preview of things to come. "SCA pilots Jeff Moultrie and Bill Rieke and long-time SCA flight engineer Henry Taylor from NASA's Johnson Space Center flew the modified Boeing 747 jetliner from Dryden to Ellington Airport in southeast Houston Oct. 24, where the big Boeing jet will be retired and eventually placed on public display," a statement on NASA's website confirmed this month. How, when and where NASA 905 will be exhibited is still to be announced — if not also still to be decided. Houston was not awarded one of the retired flown shuttle orbiters that the SCA carried, but Space Center Houston, the official visitor center for Johnson Space Center, exhibits a full size, high-fidelity orbiter mockup. Regardless of the details, the decision to display the aircraft ensures its history will be preserved. An early-model 747-123 version, NASA 905 was the 86th 747 built, rolling out in 1970 and making its first flight on Oct. 15 of that year. After serving as a flagship jetliner for American Airlines for several years, the jumbo jet was acquired by Johnson Space Center in 1974 for use by the coming space shuttle program. Prior to its conversion into a Shuttle Carrier Aircraft, the jetliner was the focus of several aeronautical research experiments conducted at Dryden (then known as NASA's Flight Research Center) including wake vortex turbulence studies that aided the Federal Aviation Administration in modifying airport approach-and-departure procedures for airplanes flying behind large commercial aircraft. NASA 905 then underwent significant structural changes and upgrades by Boeing in 1976, to prepare it for the role it would serve for the next 35 years. Modifications to the 747 included beefing up the aircraft structure, adding attach points for mounting the shuttle orbiter and installing a flight crew escape system. The latter consisted of an exit tunnel extending from the flight deck to the bottom of the fuselage and pyrotechnics to activate the hatch and cabin window release mechanisms. The additions also included vertical fins mounted at the ends of the horizontal stabilizer (tail) to aid stability when carrying a shuttle, upgraded engines, removal of most of the interior furnishings, and installation of shuttle-specific instrumentation. NASA 905 was then modified again from ALT launch to ferry flight configuration, and flew four test flights before being placed into service to carry the shuttle orbiters. Although the primary function of the SCA was to transport the orbiters back to Kennedy Space Center from Dryden or other contingency landing sites, the aircraft also carried shuttles to and from Palmdale, Calif. for modifications and maintenance. NASA 905 also ferried the Enterprise for display at special events such as the Paris Air Show in France and the 1984 World's Fair in New Orleans, La. NASA 905 flew 70 of the 87 ferry flights during the shuttle program's operational phase, including 46 of the 54 post-mission ferry flights from Dryden to Kennedy. After the orbiters were retired, NASA 905 flew three ferry missions in 2012 to deliver the shuttles Discovery, Enterprise, and Endeavour to the museums where they are currently on display. After delivering Endeavour to Los Angeles on Sept. 21, where the space shuttle was turned over to the California Science Center, NASA 905 returned to Dryden to end its service to the shuttle program. During its 42-year flight career, both as a commercial jet and as a space shuttle carrier, SCA 905 amassed 11,017 flight hours and made 6,334 takeoffs and landings. Currently, the SCA remains in flyable condition. A decision on its future use or retirement is still pending. NASA's second Shuttle Carrier Aircraft, 911, was acquired from Japan Air Lines in 1989 and, after being modified for its new role, was delivered to NASA in late 1990. It was retired in early 2012 after 386 flights as a Shuttle Carrier Aircraft, 66 of which were ferry flights with a space shuttle mounted on top its fuselage. NASA 911 is now parked at Dryden's Aircraft Operations Facility adjacent to Air Force Plant 42 in Palmdale, Calif. It is now available as a source of potential spare parts to support NASA's SOFIA, a highly modified Boeing 747 that carries a 100-inch infrared telescope on science missions around the globe. Both SCAs were owned by Johnson Space Center, though they were based at Dryden during much of their service to NASA. Click through to collectSPACE.com to see video of the Shuttle Carrier Aircraft NASA 905 departing Edwards Air Force Base for the final time.